Amateur Radio is a great way to learn about communications technology and make friends all over the world. Getting involved in this fascinating hobby is very easy and won't cost an arm and a leg. Radio Amateurs, or "Radio Hams" use two-way radio communication to make contact with other radio amateurs all over the world. They are even able to use satellites, and they can, on occasion, speak with astronauts. Radio Hams can do this from home, or while mobile in cars, boats or on foot. Cosmonaut Sergei Krikalev uses the Shuttle Amateur Radio Experiment gear while talking with students in Maine, USA. Radio Hams have a full range of communication modes at their disposal. These include plain voice, Morse code, numerous digital modes, using computers, and even graphical modes like slow scan television. As a licensed amateur radio operator you will be able to join in experiments using all these modes. Amateur radio can be enjoyed by young and old, male and female, even the most severely disabled can make friends around the world from their own homes. This hobby knows no boundaries. Be you anywhere between 10yrs and 100yrs old!! Using even the simplest of radios and antennas, amateurs communicate with each other for fun, and during emergencies, and in contests. Through HAMNET they may be called upon to handle messages for police and other public service organizations, during all kinds of emergencies, where all grid power and normal communications have been lost. 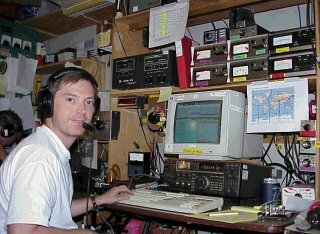 A "Ham" operator talking to a distant station or "working DX" from home. Because radio amateurs are permitted to use a wide range of frequencies and types of transmission, they must be qualified operators. In South Africa, like most countries, all around the world, Amateur Radio is regulated by the Government Department of Communication. Licensing is dealt with by the Independent Communications Authority of South Africa ( ICASA ). This exam is simple enough for anyone with a high school education, and an interest in the hobby, to pass. Click here to find out more about the Radio Amateurs Exam. In most cities and towns around the country, there are clubs that provide classes for the RAE and facilitate the writing of the test. Click here for a list of exam centers.